I haven’t done much in the way of cooking this week. After baking off my sticky buns on Sunday, we made a trip up to Ikea to get a bookcase, and on the way back home, we were involved in a 6-car wreck on I-205. My husband wrote more about it on our main blog, but everyone walked away safely. Our brand new Prius, however, was all mangled and won’t be fixed for another month. Nearly a week later, we’re still feeling the effects of the accident in our sore necks, backs, and shoulders. I’ve had headaches most of the week as well, so cooking has been kept to a minimum. We made a trip to Costco the day before the accident, though, and had a halibut fillet and a big sirloin tip roast in the fridge that couldn’t wait too long for attention. 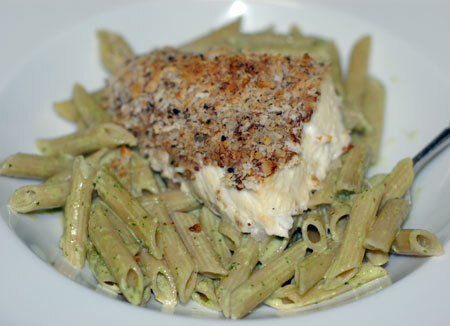 On Tuesday, I gathered my wits and put together a tasty and fairly simple dinner: roasted halibut with a walnut-panko crust and penne dressed with an arugula pesto sauce. The halibut recipe was a quick one from Epicurious; my only adjustment was to adhere the crumb topping with a smear of whole-grain mustard instead of butter. Our halibut pieces also took quite a bit longer to cook through than called for, as at 8 minutes they registered an internal temperature of about 55 degrees. You know it isn’t a good sign when your supposedly-cooked meat still registers lower than room temperature coming out of a 400-degree oven. We ended up reducing the oven to 375F and letting it go for another 10 minutes or so, until the meat was about 140F inside, and that was just right for our palates. The pasta was just penne tossed with a walnut-arugula pesto from Elise at Simply Recipes. Because the fish took longer to cook than anticipated, I ended up adding a splash of cream to the pasta to keep it from drying out, and although it was a little cold in the end, it tasted very good and complemented the fish nicely. 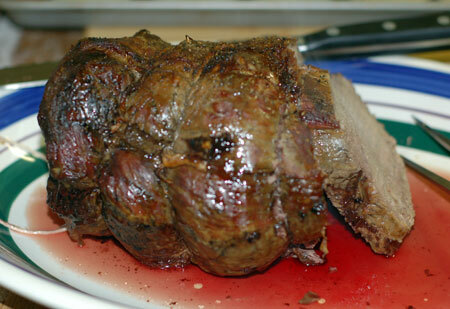 We also had in the fridge a round tip roast weighing in at over 5 pounds, so that was our dinner on Thursday night. I think I might need to work on educating Jeremy about what meals constitute a little too much time and effort for a weeknight. This meal would probably go as a holiday dinner for some people, or at the very least a Sunday supper. I kept things as simple as I could, but we still didn’t eat before 9pm. The roast was stuffed with slices of garlic and drizzled with Worcestershire sauce. I also added a cup or so of beef broth to the bottom of the roasting pan for added moisture. I was generally following this recipe, but my roast was much larger than the one called for, so it took quite a bit longer to register 150F. While it cooked, I worked on another batch of cinnamon rolls (more on that next time) and took on the mashers and Brussels sprouts. 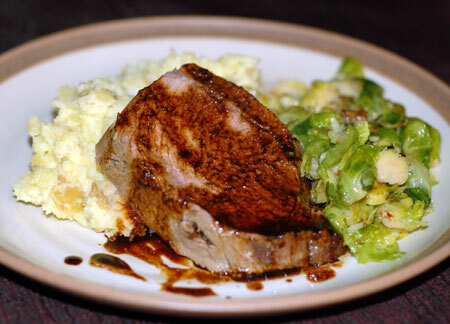 The sprouts recipe is worth mentioning because it is one of my favorite ways to eat them. It is on the fiddly side because you have to disassemble every single sprout, but the flavor is fantastic, and of course it cooks nice and evenly too. Lidia suggests serving these with a lemon sauce, but we’ve never bothered making it because we love these sprouts just as they are, all nutty and garlicky. Rinse and drain the sprouts. Working over a big bowl with a sharp paring knife, cut off (and discard) a 1/4-inch or so of the base of each sprout, freeing the outer leaves. Now stick the point of the knife into what’s left of the base and slice out the tiny core, in one cone-shaped piece — just as you would cut out the bigger core of a cabbage or cauliflower. This loosens the inner leaves. Slice the small core in slivers and drop them in the bowl. Begin peeling off the outermost leaves: discard only wilted or blemished leaves; drop all the fresh dark green leaves, even thick ones, into the bowl. Keep peeling off the leaves until you reach the tiny ones that can’t be pulled apart. Cut this bundle in slivers and drop them into the bowl. When all are done you will have a large fluffy pile of leaves. Put the oil and the garlic in the skillet and set over medium heat. Let the garlic cook and caramelize lightly for 4 minutes or so, shaking the pan now and then. Dump in the sprout leaves, shake the pan to spread them out, then sprinkle the salt and pepper flakes all over. Cover the skillet and let the leaves cook and wilt for 4 to 5 minutes, giving the pan an occasional shake, then uncover and turn them well with a big spoon or tongs. The leaves should be sizzling but not browning — lower the heat if necessary — then cover again. Cook another 4 to 5 minutes until the leaves are soft, greatly reduced in volume but still green and glistening. Serve the Brussels sprouts hot right from the skillet or turn them onto a warm platter. Update 10/6/07: We used some of the leftover beef to make Philly-style cheesesteak sandwiches for dinner. Jeremy went and got me some green bell peppers, provolone and hoagie buns to make them, sweet man. I caramelized some peppers and onions in my cast iron skillet, and then warmed up some very thinly sliced slabs of beef in the same pan. A very good use of leftovers, especially since I frequently find leftover meat unpalatable.